Inspired by the health challenges of his two cousins living with sickle cell disease, Conley partnered with Methodist Le Bonheur Healthcare in 2011 to create a dedicated medical environment to meet the needs of these patients. Conley has been a supporter of the Center for nearly 10 years, hosting multiple events including the annual Mike Conley Bowl ‘N Bash where he gathers the Memphis community for a fun afternoon of bowling while raising money and awareness for sickle cell research. 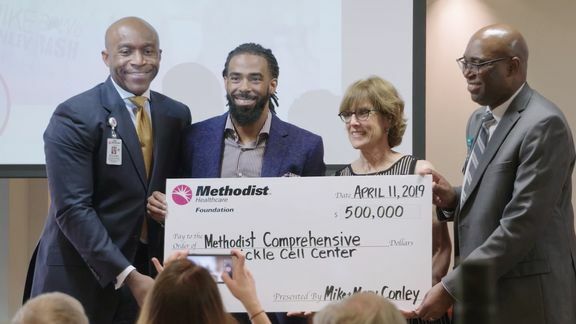 With yesterday’s gift, Conley and his wife Mary have now contributed and helped to raise over $1 million to support Methodist in delivering innovative, comprehensive care and developing new treatments for patients with sickle cell in the Mid-South. “It’s our hope that this donation will allow Methodist the ability to continue to provide the best medical care available for patients living with sickle cell disease in the Mid-South for years to come," added Conley. In recognition of this commitment and generosity, the Center’s clinic space will now be named The Mike and Mary Conley Comprehensive Sickle Cell Clinic. 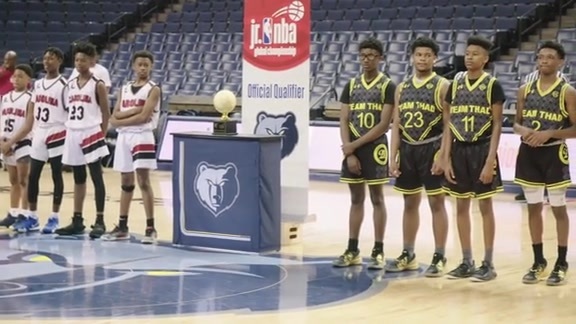 UNINTERRUPTED, the athlete empowerment brand founded by LeBron James and Maverick Carter, produced a video to document Mike Conley’s involvement with and dedication to sickle cell care. The video, available below, shows his personal connection to the disease and documents the moment where he announces his donation to patients at Methodist Healthcare. For more information on the Center and to make a donation, please visit http://www.methodisthealth.org/sicklecell. Based in Memphis, Tennessee, Methodist Le Bonheur Healthcare (MLH) has been caring for patients and families regardless of ability to pay for more than 100 years. Guided by roots in the United Methodist Church and founded in 1918 to help meet the growing need for quality healthcare in the greater Memphis area, MLH has grown from one hospital into a comprehensive healthcare system with 13,000 Associates supporting six hospitals, ambulatory surgery centers, outpatient facilities, hospice residence and physician practices serving communities across the Mid-South. MLH offers clinical expertise with a focus on improving every life touched. For eight consecutive years, Methodist Memphis Hospitals has been named a Best Regional Hospital in Memphis by U.S. News and World Report. For three consecutive years, MLH has earned a spot on the Great Place to Work® and FORTUNE magazine list of “100 Best Companies to Work For”. MLH has also been recognized by Great Place to Work® and FORTUNE as a Best Workplace in Healthcare and Biopharma and a Best Workplace for Women. MLH is also on the Forbes list of Best Employers for Diversity and is recognized by Becker’s Hospital Review as one of the 150 Top Places to Work in Healthcare.